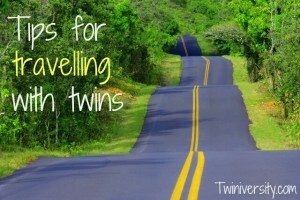 I recently had the privilege of writing an article for Twiniversity.com, the fastest growing website for parents of multiples, about tips for travelling with twins. We put these tips to good use for our recent trip over the July 4th weekend. The travel tips are great for all children, not just twins! So, I hope you try them out. It’s summer, and that means vacation time! As parents of twins, we are always in need of a vacation — but the thought of preparing for one and arriving at a destination, without pulling your hair out, can seem like a major challenge. With a few simple tips, and packing your sense of humor along with your luggage, you can be the envy of all travelling parents and get there with all hairs intact! The parental advice most often given to parents of multiples is schedule, schedule, and schedule. Babies and small children thrive with routines, and when those get interrupted, it can bring on a meltdown. Try to keep your travel day as closely in line with a normal day as possible. Plan your departure time to be after a meal at home or after a nap. If you’re travelling with babies or toddlers, it may be a good idea to leave for a road trip after their bedtime, so they sleep through the drive. If you’re travelling by plane, get advanced seat assignments if possible. Airlines often have strict rules about the number of children sitting in laps allowed on the same row. A plane ride, car ride or any form of transportation where you’re stuck in one place for hours is boring for everyone, especially the littlest ones. Bring a variety of toys, books and coloring books for entertainment. To help distract babies, attach a mobile to the inside of the roof. Velcro strips and string are an easy, safe and damage-free solution for attaching it. Also, hang toys from the car seat for babies to grab and hold. Games that include the entire family are also a great way to keep everyone focused on having fun instead of complaining. A scavenger hunt can be tailored to either road or air travel. Create a list of items to find that incorporate layovers or pit stops by including souvenirs and items unique to your route. (You can find already made, printable lists through a quick Google search for ‘road trip scavenger hunt.’ Alternatively, search the same term on iTunes for an app for your iPhone or iPad.) If your children are old enough, have them take a photo, or take one yourself, of each scavenger find during your stops. You can later help your children create a scrapbook to remember the trip. Sing-a-longs with coordinated hand motions or dance moves are also a must for travelling, especially for older babies and younger toddlers not ready to participate in a scavenger hunt or other games. You’ll also want to plan your stops for meals in advance and seek out baby/kid-friendly restaurants. Try to align the time as closely to normal mealtimes as possible. Also, pack plenty of easy-to-grab and mess-free snacks. For formula-fed babies, pre-measure the amount of powder for each bottle, so all you have to do is add water. Lastly, babies and small children are often messy and are likely to have bathroom accidents, so packing a few outfit changes is also necessary. Pack each outfit in a separate plastic bag for easy access and reuse the bag to stash away the dirty clothes. Oh great tip about the scavenger hunt on iphones. I didn’t think of that. There’s an app for everything right? I don’t have twins but I do have boy/girl Irish Twins! They are 12 months apart and I get asked at least once a day if they are twins. Your tips are so perfect! I find that I have more in common with moms of twins because…..well, with two that are the same age or very similar in age, it’s just different than having two that are several years apart. Routine is everything because it’s a double disaster when things go wrong! This was fun to read. Thanks for linking up to Whimsy Wednesday! We love having you. Hi Kelly! Thanks for visiting. 12 months apart! I bet that was a surprise My late brother and I were 12 months apart and were often asked if we were twins too. I can imagine your children are very close and probably share a lot of the same friends, just like we did. It’s such a blessing to have a sibling your own age. I am so glad to get this great information. I just say thanks allot. I also have two kids but they are not twins. They are just 1 and 3 years old. Now I am planning washington bus tours with my kids and wife to enjoy the summer vacations far from the house. Your blog is very informative for all parents. Your tips are awesome!